I did it! I ran a 5K. 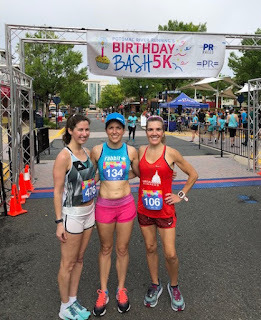 I registered for the Birthday Bash 5K several months ago before getting sick. 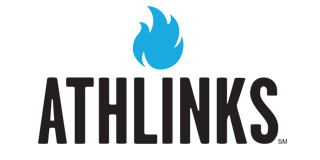 I got sick on May 31st, didn't run at all for five weeks, and then slowly eased my way back into running through a gradual progression of run-walks. This week, I was able to run/walk every day with progressively more running and less walking. I did this for about 30-35 minutes each day, and by the end of the week (yesterday) I felt confident in being able to run nonstop for a 5K, and not experience and adverse effects. The tricky thing with recovering from this illness is that it's difficult to know how much is too much. Overdoing it will cause a setback until I am 100% recovered and out of the woods. I may feel completely fine while running, only to realize the next day that it was too much. That's why I have been very gradually testing the waters and it seems as if I have finally reached 100% recovery and I won't need to worry about setbacks anymore. That said, I'm not going to start running 40+ mile weeks yet; I will continue with my gradual approach. Because I planned to run this as an easy run with Greg, I was "out of sorts" with my normal pre-run routine. I forgot my sunglasses and sunscreen, so we had to go back for them. We later realized that Greg forgot his wallet. Thankfully I had a credit card attached to the back of my phone. When we went to pick up our packets, we learned that Greg had never actually registered, so he had to do so on site. Once we pinned on our bibs, we headed for the starting area where we met up with our friends Allison and Cheryl. It was an unseasonably cool morning at 64 degrees and lowish humidity. Typically this race is 75+ degrees and I wouldn't be surprised if this was the coolest Birthday Bash in the history of the race. I was bummed that I wouldn't be able to take advantage of the weather and race full-out, but I know I'll have plenty of cool races in the coming months. Plus, if it had been really warm, I would have worried about my body rebelling since heat running seems to be what weakened my immune system in the first place. We chatted for a bit and then the race started. The plan was to simply run our easy pace and maintain it for the duration of the race. Greg and I didn't warm up so we used the first mile to establish a rhythm. The first mile is mostly downhill so I wasn't too surprised that our first mile clocked in at 8:42. The last mile of this race is almost entirely uphill. I expected that we would slow down here, but maintaining the pace didn't feel like a strain. We even passed a few people, which seemed to give me more adrenaline and energy. We were having a blast and I was so thankful to be out there and feeling good. We ran the third mile in 8:33. Since I was feeling good, I thought it would be fun to pick it up a bit for the last stretch. Cheryl and Allison cheered us in and I wore a huge smile on my face. According to our Garmins, we ran a pace of 7:52 for 0.17 miles. Pretty exciting! After writing this, I just realized that my Boston Marathon pace was faster. . . gulp! I'll get back there. We both ran official times of 27:16. With this time, I placed 12th out of 42 in my age group and 53rd out of 300 women. Cheryl and Allison (who both ran very speedy races) ran a few cool down miles while Greg and I changed into dry clothes in the car. The plan was to meet them at a nearby restaurant for brunch, but when we tried to leave, the car wouldn't start. We ended up getting a jump start from a friendly runner nearby, and then driving the car to a mechanic to get the battery replaced before having brunch. Finally the four of us enjoyed a celebratory meal at an outside table. I can't believe it was still cool enough to be eating outdoors! I'm absolutely thrilled that I was able to participate in this race and feel good for the duration of it. Better yet, 24 hours later, I am still feeling good and without any lingering fatigue or dizziness, which were my most common symptoms. I'm taking this as a sign that I am fully recovered and that I don't have to be fearful of relapse. Phew! In four weeks, Cheryl and Allison are running the Leesburg 5K/20K. I plan to participate in that event too, but not at race effort. 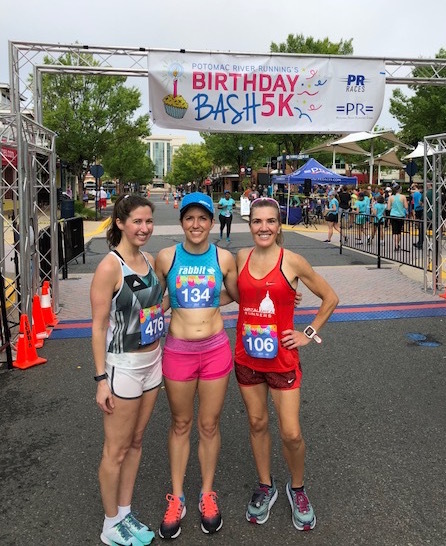 I have given up all-out racing in the summer, but it's fun to be part of a running event with friends. My next race-effort race will be in late September. Congratulations on your first race back! I know it's far from the 5K goal times you were pursuing before you got sick, but I'm glad you were well enough to run and enjoyed yourself. You finished smiling and healthy, and ultimately that is what matters. Your fitness will come back as you get back to running and eventually training, anyway. 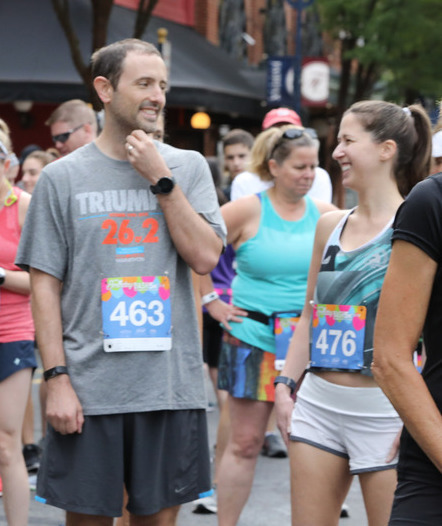 Plus, you even had a negative split and a fast finish, which means you listened to your body, didn't go out too fast, and ran a smart race for where you are. That stinks about the car not starting! I'm glad you got a jump and hope the issues get figured out. Hopefully in four weeks you can run the Leesburg race too and improve on your time :). So exciting that you were able to do this and feel good!!! Excellent because this post truly means you have caught on to the "tao" of running and how to go with the "flow" and let it take you where it be! Hey...at that 5k speed you and Greg doing...I might actually be able to keep up with you...LOL! And to finish as high in place in Division and not so far down there overall, just be happy with that. 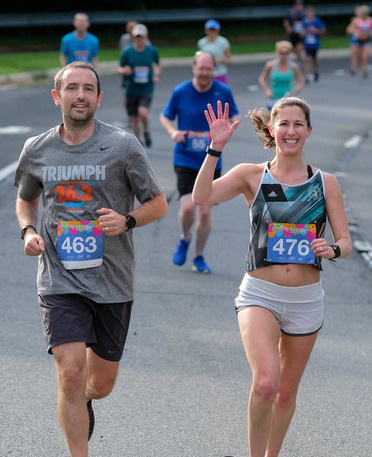 The most interesting pic you post is one of you and Greg running side-by-side and easy to tell the effort not hard, and more importantly both of you happy and looking like the Brooks "run happy" mantra! I recognize you want to go the full competitive racing way...but I think your approach is what you need to do to both recover from the illness and rebuild yourself progressively back to your competitive abilities. Would point to recent Runners World with long expose about #1 top notch obstacle course and ultra distance runner, Amelia Boone. Pretty poignant description of her former and current self...in some ways...have relevance to both your past and your current situation. I am sure you have read it, but if not...check it out. Great insight that Boone woman provides...you too! Not anything to do with this post, but been remiss in following-up to Boston 2018. I missed your designated greet/book signing engagements, and I still have this unicorn ring and the example of the Zebra Wrist Banjee to send you. But I have no idea where to send it to. You can email me at froggermauger@comcast.net or you can PM me on Facebook at my FB page, but I understand if you don't...but I am a trustworthy person. Sidebar - I posted about receiving my Finishers Record Book and Certificate for last year's Boston run in the deluge...finishing 10th consecutive! I was concerned because I couldn't find anything how to verify what to expect for registering for the 2019 race and I think I included some mention in there I was disappointed BAA doesn't send something post or with the Official records mailing indicated a congrats on 10 straight Boston Marathons. But RD Dave McGillvary posted response on that post I made on FB explaining the process BAA does and what to expect. Apologize for inserting my "glory" so to speak, in your space and personal journey. I encourage you...get back to Boston each year and keep a streak going! A great portrayal on a 5k race you and Greg simply ran at lesiure! Smart move. I know you're probably itching to be back at full speed, but a fun 5k was probably just what you needed. Whenever I read your blog, I'm always so impressed at your restraint and ability to listen to your body. You didn't push it and you finished feeling encouraged and strong! That's the way to have a comeback. Congrats!